An anonymous individual has donated these items for the taking - as usual - first replies get the requested items. NOTE - one item per person and IT support won't be provided for these. I'll have more stuff to give away soon so keep an eye out for my next email. 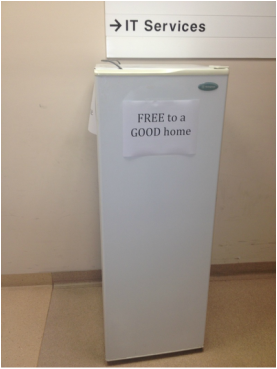 Today you have the oportunity to pick this fridge up for nothing (well just the weight) We can help you move it if you need. First in to comment gets the fridge. No replies by email will be accepted. This morning I have 2 sets of Golf Clubs up for Grabs. Good luck and get in quick. As promised - here is the 3rd round of giveaways for 2011. Please leave a comment to choose your selected item - emails requesting items won't be accepted. Only Monash / PHI / JHF Staff accepted. One item per person and nobody who has got anything from the previous giveaways can apply for these items. Same goes for the pickup - only between 9-3 tomorrow from the eSolutions-MMC office. _I have the following items to give away - collection from MMC eSolutions office tomorrow before COB. The items will be available for collection between 9:00 and 3PM. Please respond in the comments for your selection - if someone else has already asked for it then consider it off the list. Please leave your full name in the comments so I know who the items are for. Click on the item for an image. Check back later as I will add more items to the list.